Who's Calling | Call Tracking and Multi-Channel Marketing Solutions | Blog: Shark Week: Chomp Down on These Marketing Tips! What was that? You think there’s a more action-packed, informative and wildly fascinating week of nonstop entertainment on TV? Bull Shark! Just as sharks are the apex predators of the ocean, Shark Week is the apex Primetime event of the year. This is the one week out of the year when every ordinary couch dweller can be a marine biologist; it’s the week that even the most ocean-fearing viewers can turn into total shark fin-atics. Our favorite week is back on Discovery Channel — this time earlier than ever — and we couldn’t be more excited. Needless to say, this week’s frenzy of shark facts got us thinking about a few tips that will launch your marketing out of the water. Sharks are, without a doubt, the most superior predator of the sea (ask any of the seals on Seal Island. RIP). They have the ability to propel their massive, two-ton bodies upwards of 30 mph through the water, making them near-perfect hunting specimens. How do they generate such impressive feats of speed and raw power? Their streamlined bodies help them glide through the water with minimal resistance, allowing them to torpedo towards their prey. Likewise, streamlining your marketing activities is essential to improving your ROI. In doing so, it’s important to gauge the success of each of your marketing campaigns so you can limit the ones that prevent you from reaching your marketing objectives. Tracking customer response rates is an effective way to monitor which campaigns are producing the best results and which are just taking a bite out of your budget. 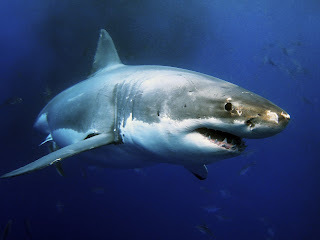 To increase their success rate when hunting their favorite prey, Great Whites have adapted their tactics significantly. Since seals can change directions in the water faster than sharks can, the sharks learned to use their strengths (straight-line speed and power) to surprise the seals from below. To fin-ish off the incredible display, the sharks launch their entire bodies out of the water to stun both their prey and every Discovery Channel viewer. Similar to how quickly seals change directions in the water, markets and industries are ever changing. As a marketer, your target audience may stay the same over time, but using the same approach won’t always remain effective. Specifically, in today’s digitally driven world, social media and digital advertising have replaced the likes of newspapers and print media as the most popular forms of advertising. With 2.55 billion social media users projected in 2017, your company should adapt to the changes to increase its success. To add to the seemingly endless array of striking shark facts, sharks have not five (like humans)… not six… but seven senses. We don’t know how M. Night Shyamalan — writer and director of “The Sixth Sense” — didn’t see the potential for an epic sequel featuring sharks. We digress. Sharks use each of their seven senses when hunting prey. With the ability to sense electrical pulses and both vibrations and changes in underwater pressure (in addition to our five human senses), sharks are some of the most resourceful predators in the ocean. No wonder they're at the top of the food chain! Just as sharks use all their senses when hunting, we encourage you to use as many resources as possible to adapt your marketing strategy and give your company a competitive advantage. From online-to-offline analytics to trackable phone numbers to mobile marketing solutions, the list of marketing tools available to you is limitless. By maximizing these resources, you can ensure that your business stays on top of the corporate food chain. Do you have any more jawsome marketing tips? We want to hear! Tweet your responses to @whoscalling and don’t forget to mention @Discovery and #SharkWeek!